Ten days until Grave Dance hits shelves--It's almost here! I think now is a good time to give things away, what do you think? and finallyGrave Dance (mass market)What do you think? See anything you like? I can't believe we are at 11 days and counting until the release of GRAVE DANCE. Which means it's time to share the final excerpt from the book. The first section of chapter two is now live on the excerpt page. I hope you enjoy! In the next couple days I'll be announcing my blog tour. Things have been so busy that I'm a bit behind on my scheduling, but be on the look out for dates and locations. I have a special guest joining me today on the blog. 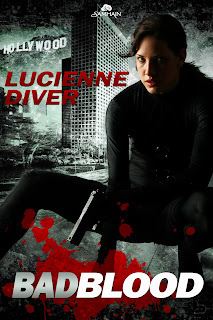 Please welcome (back) my very fabulous agent who also happens to be an absolutely amazing writer, Lucienne Diver! Writers are readers, first and foremost. A love of reading is what drives most of us to write and to create stories for others to read and enjoy. So, once in a while I like talk about books on my To Be Read (TBR) pile. Before I go on, I have to say that 'pile' is a rather deceptive word. Try TBR bookshelf. Stacked 2 books thick. I'd post a picture, but I'm almost embarrassed by all the books I want to read but haven't had time yet. There are tons of great books hitting shelves, and I just can't keep up. But that doesn't mean I'm not hugely excited about the books, and Amazon just sent me two new releases I absolutely can't wait to dive into. I'm back from ConCarolinas, and I had an absolutely amazing time. Hands down, this is always one of my favorite cons--it has been for years (since long before I started hitting the circuit as a guest). Why is it so amazing? Hey guys. Sorry for the total media silence recently. There has been an utter lack of blogging, tweeting, and facebook and I owe several of you emails. I'm hoping to catch up on email before I leave for the con this weekend, but if I can't reply to everyone, some emails might be answered next week--But don't give up on me! I promise I read every single email and I will reply. (Unless the black void of cyberspace ate the email. If you don't hear from me by the end of next week, you might want to re-send.) As far as twitter and facebook: good news! This weekend is ConCarolinas--one of my favorite small regional cons--so I should have plenty to tweet about in the coming days.